By analyzing the DNA of two prehistoric dogs from Germany, an international research team led by Krishna R. Veeramah, Ph.D., of Stony Brook University in the USA has determined that their genomes were the probable ancestors of modern European dogs. The study also suggests that all contemporary dogs have a common origin and emerged through a single domestication process of wolves 20,000 to 40,000 years ago. Researchers at Johannes Gutenberg University Mainz (JGU) also participated in the study, the results of which recently have been published in Nature Communications. Dogs were the first animals to be domesticated by humans. The oldest remains of dogs that can be clearly distinguished from those of wolves originate from what is now Germany and are about 15,000 years old. Unfortunately, the archaeological record is ambiguous, with claims of ancient domesticated dog bones from the most varied locations as far away as Siberia. Only last year were researchers able to sequence the genome of a 5,000-year-old dog from Ireland using the latest paleogenomic techniques. The results of the study led the research team at the University of Oxford to suggest dogs were domesticated not once but twice. In addition, the research team also hypothesized that an indigenous dog population domesticated in Europe was replaced by incoming migrants independently domesticated in East Asia during the Neolithic period. "Contrary to the results of this previous analysis, we found that our ancient dogs from the same time period were very similar to modern European dogs, including the majority of breed dogs people keep as pets," explained Veeramah, Assistant Professor of Ecology and Evolution at Stony Brook University. "This suggests that there was no mass Neolithic replacement that occurred on the continent and that there was likely only a single domestication process for the dogs observed in the fossil record from the Stone Age and that we also see and live with today." In their article "Ancient European dog genomes reveal continuity since the Early Neolithic," Veeramah and his colleagues used the older 7,000-year-old dog to narrow the timing of dog domestication to the 20,000 to 40,000 years ago range. They found evidence that the younger, 4,700-year-old dog represents a mixture of European dogs and a population that resembles current Central Asian/Indian dogs. This finding may reflect people migrating from the Asian steppe to Europe at the beginning of the Bronze Age, bringing their own dogs with them. "Our study shows how the analysis of entire ancient genomes can help us to gradually understand complex processes, such as dog domestication. Only direct insights into the past like this enable us to disentangle the effects of the many parallel and successive events that are involved, including targeted breeding by humans as well as population movements and admixture of multiple populations," added Dr. Amelie Scheu, one of the primary authors of the article and a research assistant in the Palaeogenetics Work Group at the Institute of Organismic and Molecular Evolutionary Biology at Johannes Gutenberg University Mainz. Overall, however, the question where exactly dogs were first domesticated in geographic terms remains a mystery, although Veeramah expects that the sequencing of additional ancient Eurasian genomes will help to eventually solve the issue. The study and findings are a collaboration between scientists at Stony Brook University and the University of Michigan in the USA, Johannes Gutenberg University Mainz and the University of Bamberg in Germany, Trinity College Dublin in Ireland, and the Directorate-General for Cultural Heritage in Rhineland-Palatinate, Germany. 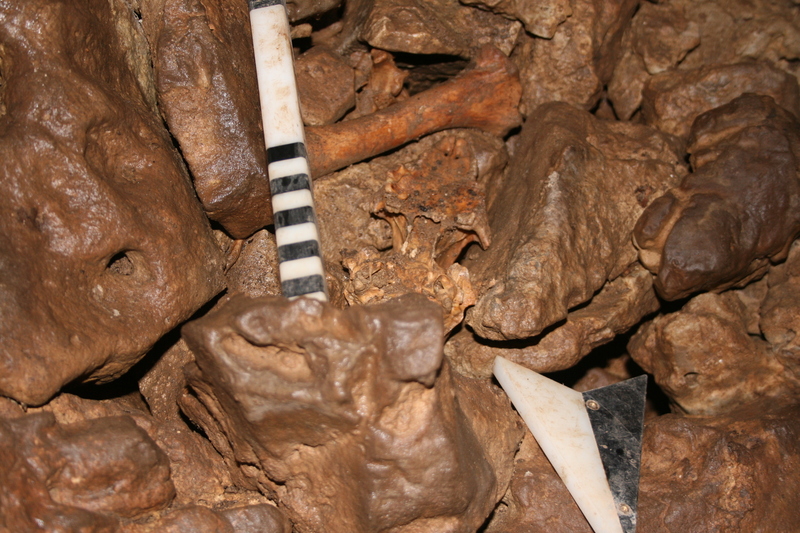 The skull of the 4,700-year-old Neolithic dog was found in the Kirschbaumhöhle (Cherry Tree Cave), here still in situ before whole genome sequencing. 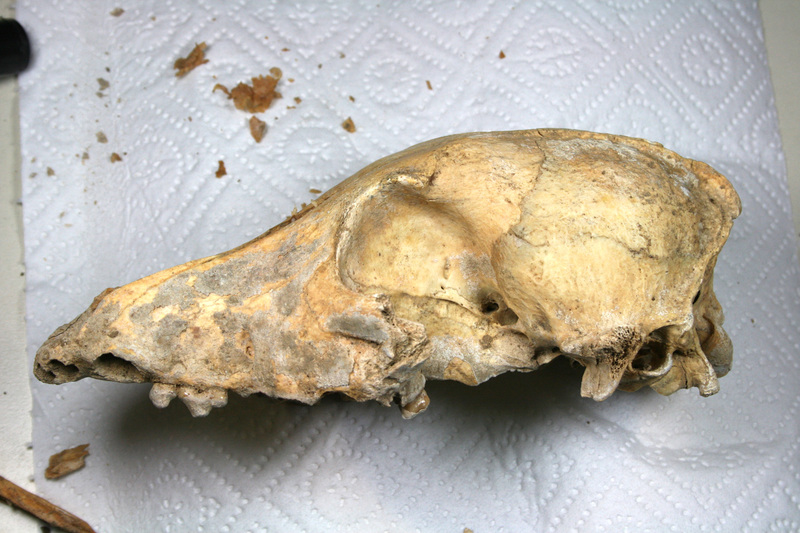 The skull of the 4,700-year-old Neolithic dog found in the Kirschbaumhöhle (Cherry Tree Cave) in the lab, shortly before the animal's entire genome was sequenced.